Five parties in Ukraine’s parliament, the Verkhovna Rada, officially formed a governing coalition on Thursday that faces the daunting task of fulfilling the Ukrainian public’s expectations of reform in the crisis-hit country. The coalition, named “European Ukraine” is made up of 302 MPs mainly from the Bloc of Petro Poroshenko, the Popular Front, the Samopomich Party, the Radical Party and the Batkivshyna Party, all of which are pro-European, but which are headed by politicians who do not always see eye-to-eye. Earlier, the five parties agreed on a text of a coalition agreement that sets out the grouping's manifesto for change in Ukraine. The negotiations over the agreement lasted for practically a month after the parliamentary elections on October 26, with rumors of political tensions between President Petro Poroshenko and current Prime Minister Arseniy Yatseniuk. 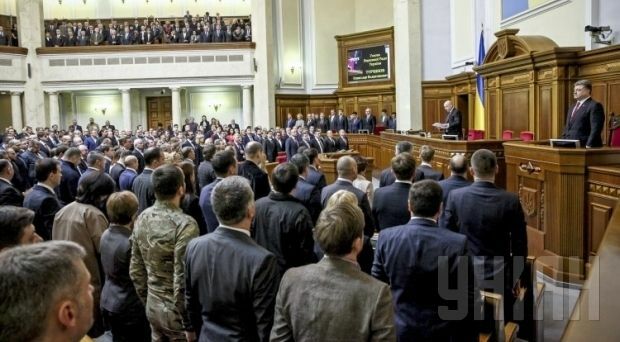 Poroshenko’s Bloc of Poroshenko has the biggest faction in parliament of 146 MPs, but Yatseniuk’s Popular Front, with a faction of 83 MPs, won the popular vote in the October 26 elections. However, due to Ukraine’s mixed proportional/constituency voting system, where half the Rada’s 450 seats are awarded under party lists, and half in majority elections in constituencies, the Bloc of Poroshenko ended up with many more seats in parliament than the Popular Front. Meanwhile, there is a heavy police presence near the parliament building to maintain public order. Earlier civil activists promised to prevent MPs who voted for the “Dictatorship Laws” of January 16 from entering the parliament. More than 60 MPs from the previous parliament who voted for these laws have been re-elected. The laws, which were put forward by supporters of then President Viktor Yanukovych, were modelled on Russian laws that grant the president strong powers and significantly restrict civil liberties. The passing of the laws on January 16 is one of the factors that sparked the violent response from Ukrainian protesters on January 19 to Yanukovych’s efforts to quell opposition to his regime.